The Greater Baltimore Committee has joined with the Healthy Harbor Partnership to find funding and community volunteers for specific projects that will greatly reduce the amount of storm-water runoff and accompanying pollutants that go into our harbor every day. 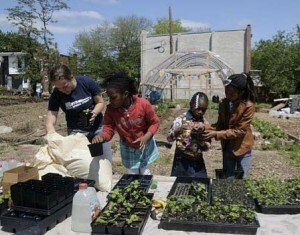 Each project is located in a Baltimore community that has already demonstrated both a willingness and ability to effect change, including a community plan and completed projects. Following is a list of projects that require minimal funding. Individuals can participate by donating funds toward one of the projects or by donating the full amount to fund a specific project. Companies can do the same individually or join with other companies to fund a larger project. Companies can also participate by organizing volunteer days with their employees to visit the sites and help in the storm-water remediation efforts. Every company and individual that donates will be recognized at the project site and by the GBC and the Healthy Harbor Partnership. Thank you to McGuire Woods LLP and P. Flanigan & Sons for donating to Healthy Harbor projects. 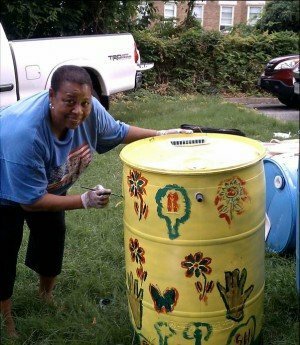 Provide a free rain barrel workshop to underserved residents in a Clean Water Community; can be done for any neighborhood; Healthy Harbor Partnership will supply rain barrels and training; company or individual funder’s name will be affixed to the rain barrels. Cost: $1,170 total project cost. Eighteen rain barrels are needed per workshop and those can be individually purchased/donated for $65 each. In 2012, 270 rain barrels were installed that captured 330,000 gallons of stormwater. 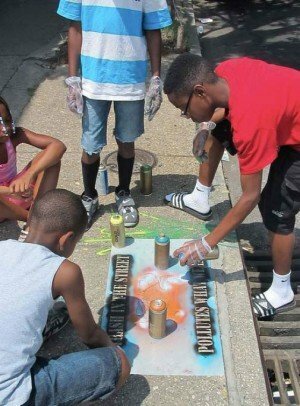 Green one city block with street trees – including tree planting and tree pit expansion – stenciled storm drains and a trash clean-up event; can be done for any neighborhood; company or individual contributor’s name goes on tree plaque. For each block, 12-15 new tree pits are needed, which can be individually purchased/donated for $550 per pit. Individuals or companies can also donate to expand a single existing tree pit for $350 per pit. 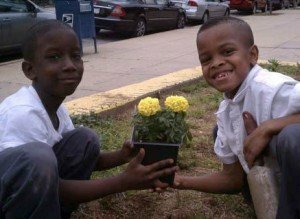 In 2012, 39 tree planting events were held that planted 1,995 trees in Baltimore City neighborhoods. Funding for this project is currently focused in the Greenmount West neighborhood, but if sponsors are interested in funding another community, they can contact the Waterfront Partnership to discuss. An expanded version of the community block greening project, focusing on three partner neighborhoods in helping them develop and implement a sustainable street tree program. Cost: $2,500 (developing a master plan); $350-$550 (creating or expanding 50-60 tree pits. A water wheel was operational in 2008 and removed about 30,000 pounds of trash annually. But the wheel was too small to continue to use and was removed from the watershed. Construction and installation of a new, larger water wheel has been fully funded while operation and maintenance will be handled by Waterfront Partnership. They are seeking funding for a boat that will dedicated to servicing the water wheel. Replace 9,500 square feet of asphalt parking lot with 2,400 square feet of bio-retention. Create a “storm-water theme park” in this under-utilized park that has received much scrutiny for its significant contribution to storm-water runoff and trash that reaches the Inner Harbor to draw people’s attention to the issue of storm-water using creative, engaging storm-water best management practices, while at the same time creating a more inviting and user-friendly urban park. You can only know where you are going if you know where you’ve been. The Healthy Harbor Report Card allows the Waterfront Partnership and Blue Water Baltimore as well as the public to gauge the success of projects implemented and its effect on the quality of water in the Harbor. Healthy Harbor is currently looking for sponsorships of $5,000, $10,000 or $25,000 or in-kind lab services to conduct a report card on an annual basis. Thank you McGuireWoods LLP for your commitment of $6,800 to install an irrigation system, remove debris and supply wood chips, mulch and soil to the Whitelock Community Farm in Reservoir Hill. Thank you to P. Flanigan & Sons for your donation of $7,500 in kind asphalt removal services for the St. Stephen & James United Lutheran Church Asphalt Removal Project. If you have any questions or need more information, call 410-727-2820.